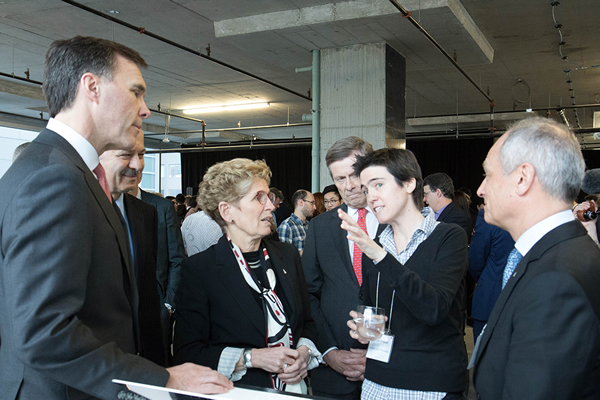 With the creation of the Toronto-based Vector Institute, Ontario and Canada are choosing to lead in the booming field of artificial intelligence, said Ontario Premier Kathleen Wynne. "We can own this space. This is who we are," she told a crowded room filled with University of Toronto researchers, officials from all three levels of government and top Canadian companies who are supporting Vector. The applications and implications of this ground-breaking research could be seen in demonstrations on self-driving vehicle technology by Associate Professor Raquel Urtasun as well as U of T startup Deep Genomics, founded by cross-appointed Professor Brendan Frey (ECE), a graduate of U of T Computer Science.